If you want a high-quality interface for studio, rehearsals and gigs you have to look at this. Great onboard latency-free FX which let you get the sound right before you record it. Incredibly compact and truly portable. It would be great to have a few compressors to choose from. Antelope doesn't tend to scrimp on quality for its products and the Zen Tour is no exception. It is very compact for its functionality and feels solid. It has a small but accessible touchscreen which allows you access to all the basic functions of the unit with the most used functions, like input gains, headphone levels and talkback, directly accessible using buttons on the front panel and the large 'soft' knob. At the front are two headphone outs, two re-amping outs and four line/Hi Z inputs, all on 1/4-inch jacks. To the rear are four dual XLR/1/4-inch inputs, two pairs of monitor outs on 1/4-inch jacks, eight analogue outs on a DB25, two RCA sockets for S/PDIF in and out, a power connector and USB and Thunderbolt sockets. It stands up very well against the other interfaces in our studio but its incredible flexibility is the real winner. On the left-hand side are two pairs of ADAT ins and outs. As you can see, for a very small unit it has a hell of a lot of connectivity. Once you have the software installed on your computer and connected you are ready to go. When you first look at the routing page in the software you may be confused as there are an inordinate number of routing possibilities. The best advice is to follow Antelope's online video tutorial as the sooner you get to grips with this the better. It is the beating heart of every Antelope interface and is incredibly flexible and comprehensive. Having plugged in your first instrument, say a guitar, you can then set the gain either directly on the Zen or in the software. Should you want to apply one of the onboard DSP FX, you simply route the channel to an FX processor and then send that to the headphone and monitor outs and to a DAW input to record. There are six Amplifier emulations covering vintage to modern and clean to downright filthy. They sound great and unlike some software emulations have a great dynamic response. For the mic inputs, where you want EQ and compression, you have a great range of EQs, all with distinctive characters but only one compressor. Fortunately it is a very good 1176 emulation but it would be good to have a couple of others to choose from. That said, like the amplifiers, they all sound excellent. 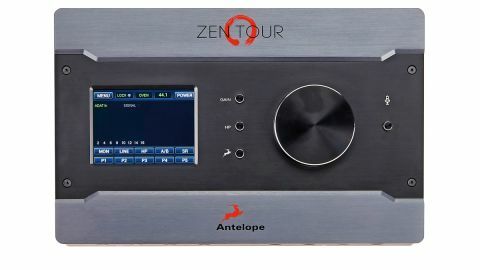 Antelope has a very good reputation for sonic quality and the Zen is no exception. It stands up very well against the other interfaces in our studio but it is its incredible flexibility which is the real winner. You can set up two headphone balances and a monitor mix all with zero latency monitoring even if using onboard DSP, it makes re-amping a doddle, happily handles 16 extra channels via ADAT and fits in your computer bag along with your laptop. It holds its own sonically with pretty much anything on the market. Excellent.